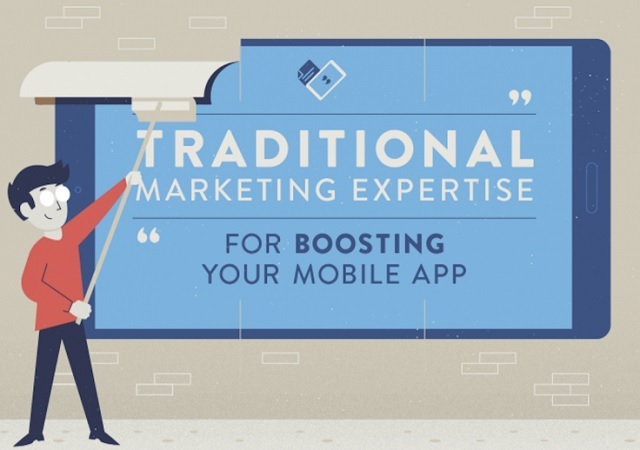 Traditional Marketing Expertise for Boosting Your Mobile App #infographic ~ Visualistan '+g+"
Whether you’re a startup company or an old business rooted in tradition, mobile marketing can seem like an intimidating aspect to add to your marketing mix. Before you can implement a strategy for mobile app acquisition and retention, you need a mobile app. Not to worry, though, because many freelancers can build iOS and Android apps for affordable prices. Once you have or plan to have, your smartphone app up and running, you can start devising a mobile marketing plan. Mobile marketing has some different metrics than traditional advertising, such as CTR (click-through-rate) or CPC (cost per click) versus traditional impressions. The availability of mobile devices has allowed for entirely new strategies such as location-based marketing, but several other tactics and strategies can be transferred to mobile marketing from traditional marketing. When TV, radio, and print ads reigned supreme, an abundance of data and best practices were gathered regarding advertising and marketing.